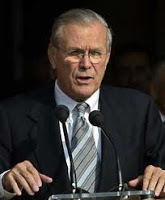 Donald Rumsfeld Archives - Joe.My.God. Louis CK To Rumsfeld: Are You A Flesh Eating Alien Lizard Person? While guest-hosting on the Opie & Anthony Show yesterday, comedian Louis CK repeatedly asked Donald Rumsfeld to deny to that he is a “flesh-eating alien lizard person” and whether he has “tasted human flesh.” It all starts around 2:30.